I had one of the strangest experiences ever in the past 24 hours. Yesterday evening I noticed that I was not getting any audio in Firefox. I first thought this was a hiccup and restarted the browser to see if this resolved the problem. It unfortunately did not. I then tried to play videos on other sites first to see if it was a site specific issue or global. Once verified that Firefox was not playing sound at all I checked if I could hear audio on the local system which worked fine. 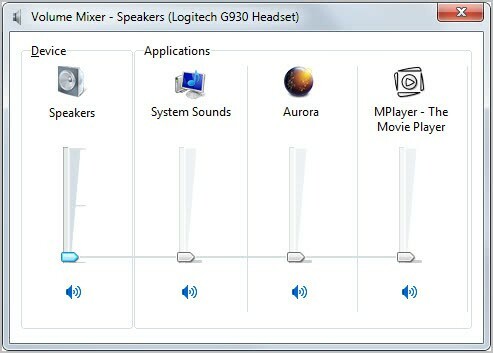 I remembered that Windows 7 had audio mixers for every application capable of playing audio. It could have happened that the volume for the Firefox browser was all turned down. Turned out it was not unfortunately. Next check was the Google Chrome browser, and this is when things got really weird. I could not hear any audio in Chrome either. Checked on YouTube and several other video hosting sites and sound was not playing. My next guess was a issue with Adobe's Flash plugin. I switched to HTML5 playback on YouTube, but audio was still not playing. A check on Adobe's website revealed that the latest Flash version was installed on the system. My next - and last guess - was that the installed audio driver was corrupt somehow. I did not put to much hope into the solution though as it felt unrealistic as audio was still playing on the desktop. Still, I went to the Logitech website and downloaded the latest driver version for my G930 wireless headset. I checked playback in Firefox and Chrome after driver installation, and guess what; Audio was playing again. 1. Restart the browser, play again in same browser. Is there anything else that you can do if those steps do not fix the issue on your end? Nothing comes to mind to be honest. Anyone with additional suggestions? my next move, along the lines of missing or corrupt registry, would be to run CCleaner and run the registry cleaner! I sometimes get No Sounds and not only in my Browser and when I check the Volume Icon in the Notification Area, I see that the Volume has been Muted and a simple click re enables the sounds! I had a similar problem – no sound whenever Chrome was running. No matter what I tried nothing helped. Finally I found it: a tiny checkbox was ticked in the options of a recently installed chrome extension. Chrome Toolbox turns off the sound by default. So what did you come up with? Any solutions? The thing that fixed it for me was the reinstalling of the audio drivers. Wow, I wonder how the drivers were corrupted? I’d like to trey your solution: re-installing the audio drivers. Can you instruct me how to do that? nevermind I got it fixed. Hi Martin. So you downloaded the latest drivers for you Logitech headset and everything worked. Did you first try to try unplugging the Logitech USB transmitter and directing all the sound to your speakers to see if that worked? btw, I have the same G930 headset. It sounds awesome when I play my PC games (mainly COD-series and SWTOR). I never use it for anything else though. I suppose this could work as long as you have another sound card in the PC, but it likely won’t solve the headset sound issue. I guess I was thinking about my setup. When the sound goes dead on my G930 (always due to the battery dying) I just unplug the USB transmitter which automatically switches everything to my desktop. In between the dead sound I almost freak out and mentally start to diagnose what the problem is. My head is not straight since I usually have been playing a game for over an hour, lol. But that is really odd that non-browser sounds were still working. I had the same problem. No sound in Firefox or Chrome. Never had the problem before. CCcleaner fixed it. N of 1. Thanks. In your chrome browser write “about:plugins” and a window will appear showing you some stuff that have a disable button under them. Click disable button but only on this one . Let the other components of the shockwave player enabled. This should have fixed your sound and youtube videos getting stuck. Hit the nail on the head. This problem didn’t start until tonight when I started my desktop back up, but I was problem free all morning and afternoon. This worked perfectly, thanks a million. Thank you SO much!!!! Worked like a charm! Thank you. A quick and simple solution to an annoying problem. I downloaded both the Adobe Flashplayer and Shockwave player uninstallers, and ran them. Then just re-installed and it solved the issue for me. I had 3 versions running although i know some have 2. I disabled all but the oldest and it worked again after i refreshed a video. It also fixed an issue where youtube videos only played for 11 seconds or so. @ Paul and Dannie McHugh – u guys rock. I was dying to find a solution for this for past 2 days. urs worked. Thanks a million guys. Found i had 2 versions of flash (under ‘details’ drop-down). I disabled the older one, and the problem has gone. Let’s hope it stays that way.